Nursing is a respected industry that is essential for the health of the community. Our Diploma program prepares you to work in a variety of health settings, including mental health, aged care, and hospitals. Upon successful completion of this qualification, you may apply to the Australian Health Practitioner Regulation Agency (AHPRA) to be considered for registration as an Enrolled Nurse. Mandatory clinical industry placement experience (unpaid, minimum of 400 hours in total) will be provided in areas such as acute care, aged care, mental health rehabilitation, community nursing, diabetic and wound clinics, primary health and palliative care. The hours generally are broken up in blocks of 1 week, 2 weeks or 3 weeks throughout the three semesters. Use your mouse on the video below to get a 360` look at CIT's Nursing Lab. 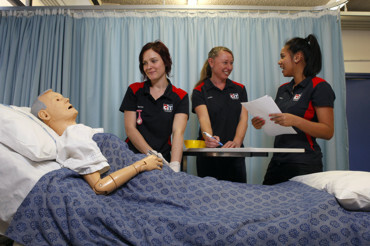 Students who achieve an IELTS 6.5 (Academic) can apply for the Certificate III in Individual Support (Ageing) which may provide a pathway into the Diploma of Nursing. Students who achieve an IELTS 6.0 (Academic) can apply for the Certificate III in Individual Support (Ageing) and the Certificate IV in Ageing Support which may provide a pathway into the Diploma of Nursing. Upon completion of the Aged Care program, students are required to sit an IELTS test and meet the Nursing entry requirement (Academic IELTS 7.0 with no band score less than 7.0). Description: This unit describes the skills and knowledge required to perform nursing interventions to support the social and emotional wellbeing and nursing care needs of the older person in both acute care settings and residential care environments. This unit applies to enrolled nursing work carried out in consultation and collaboration with registered nurses, and under supervisory arrangements aligned to the Nursing and Midwifery Board of Australia regulatory authority legislative requirements. Description: This unit describes the skills and knowledge required to practise as a nursing professional within the Australian health care system, providing health care across the lifespan of people in a range of health and community care services or environments. This unit applies to enrolled nursing work carried out in consultation and collaboration with registered nurses, and under supervisory arrangements aligned to the Nursing and Midwifery Board of Australia regulatory authority legislative requirements. Description: This unit of competency describes the skills and knowledge required, within the scope of practice, to perform preliminary and ongoing physical health assessments of all body systems, gathering data that contributes to a person's individualised health care plan. This unit applies to enrolled nursing work carried out in consultation and collaboration with registered nurses, and under supervisory arrangements aligned to the Nursing and Midwifery Board of Australia regulatory authority legislative requirements. Description: This unit describes the skills and knowledge required to implement nursing care as outlined in a person's plan of care, evaluate outcomes of care provided, record and report progress, and respond to an emergency situation. This unit applies to enrolled nursing work carried out in consultation and collaboration with registered nurses, and under supervisory arrangements aligned to the Nursing and Midwifery Board of Australia regulatory authority legislative requirements. Description: This unit describes the skills and knowledge required to apply effective communication skills with a person, family or carer and with other healthcare professionals in a variety of health care settings. Communication skills in nursing practice require using information technology as well as interpersonal skills applied therapeutically in nursing care and small group discussions. This unit applies to enrolled nursing work carried out in consultation and collaboration with registered nurses, and under supervisory arrangements aligned to the Nursing and Midwifery Board of Australia regulatory authority legislative requirements. Description: This unit describes the skills and knowledge required to obtain and interpret information about client health status and to check a client's physical health. It requires a detailed knowledge of anatomy and physiology. 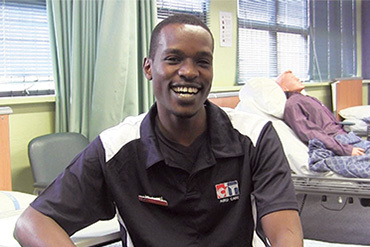 This unit applies to individuals working directly with clients and who assist in the provision of health care services. Some disciplines may be subject to state/territory regulatory determination regarding delegation and supervision. Description: This unit describes the skills and knowledge required to apply contemporary wound management principles to the care of various types of wounds. It involves working with the interdisciplinary health care team to contribute to assessment, treatment and ongoing management of a person's wounds. This unit applies to enrolled nursing work carried out in consultation and collaboration with registered nurses, and under supervisory arrangements aligned to the Nursing and Midwifery Board of Australia regulatory authority legislative requirements. Description: This unit describes the skills and knowledge required to within work legal and ethical parameters in professional nursing practice, including supporting rights and meeting duty of care requirements. This unit applies to enrolled nursing work carried out in consultation and collaboration with registered nurses, and under supervisory arrangements aligned to the Nursing and Midwifery Board of Australia regulatory authority legislative requirements. Description: This unit of competency describes the skills and knowledge required to provide clinical nursing skills for a person with complex needs and to contribute to complex nursing interventions using critical thinking and problem-solving. This unit applies to enrolled nursing work carried out in consultation and collaboration with registered nurses, and under supervisory arrangements aligned to the Nursing and Midwifery Board of Australia regulatory authority legislative requirements. Description: This unit describes the skills and knowledge required to provide nursing care using a palliative approach in care environments such as hospitals, home and community care, hospices and long-term care facilities. This unit applies to enrolled nursing work carried out in consultation and collaboration with registered nurses, and under supervisory arrangements aligned to the Nursing and Midwifery Board of Australia regulatory authority legislative requirements. Description: This unit describes the skills and knowledge required to contribute to the care of the person with an acute health problem by performing clinical nursing skills and interventions that support the person's health care needs and assist them to regain optimal function and lifestyle. This unit applies to enrolled nursing work carried out in consultation and collaboration with registered nurses, and under supervisory arrangements aligned to the Nursing and Midwifery Board of Australia regulatory authority legislative requirements. Description: This unit describes the skills and knowledge required to contribute to the care of a person with chronic health problems by performing nursing interventions that support the person's needs and assist them in maintaining an optimal lifestyle. This unit applies to enrolled nursing work carried out in consultation and collaboration with registered nurses, and under supervisory arrangements aligned to the Nursing and Midwifery Board of Australia regulatory authority legislative requirements. Description: This unit describes the nursing skills and knowledge required to work in a primary health care environment including community-based, educational, occupational and informal settings, and in general practice. Primary health care involves a person-centred and holistic approach to health care. It is made accessible to people by being located as close as possible to where they live, and supporting their full participation in a spirit of self-reliance and self-determination. This unit applies to enrolled nursing work carried out in consultation and collaboration with registered nurses and under supervisory arrangements aligned to the Nursing and Midwifery Board of Australia regulatory authority legislative requirements. Description: This unit describes the skills and knowledge required to provide nursing care to a person with diabetes including assessing needs, planning and implementing complex nursing interventions, evaluating outcomes, and educating the person on his/her condition and available resources. This unit applies to enrolled nursing work carried out in consultation and collaboration with registered nurses, and under supervisory arrangements aligned to the Nursing and Midwifery Board of Australia regulatory authority legislative requirements. Description: This unit describes the skills and knowledge required to administer and monitor medications and intravenous (IV) therapy including calculating dosage requirements, interpreting written instructions from an authorised prescriber, assessing the person for medication effectiveness and side effects, and responding to an allergic pharmacological reaction. This unit applies to enrolled nursing work carried out in consultation and collaboration with registered nurses and under supervisory arrangements aligned to the Nursing and Midwifery Board of Australia regulatory authority legislative requirements. Description: This unit describes the skills and knowledge required to contribute to the nursing care and management of a person with a mental health condition. This unit applies to enrolled nursing work carried out in consultation and collaboration with registered nurses, and under supervisory arrangements aligned to the Nursing and Midwifery Board of Australia regulatory authority legislative requirements. This program prepares you to work in a variety of health settings, including mental health, aged care, and hospitals. Upon successful completion of this qualification, you may apply to the Australian Health Practitioner Regulation Agency (AHPRA) to be considered for registration as an Enrolled Nurse. Study is conducted in the Simulated Work Environment (SLE) where students will practice skills and perform assessments prior to industry placements, for example, personal care, manual handling, performing vital signs and administering medications. Study modes also include clinical placements (work experience), self-directed learning and on-line learning and student engagement through e-Learn. Students are assessed in various ways. Students must complete class work, assignments, practical components and project work throughout a course. They may then be assessed using a combination of these tasks. Assessment outcomes may be based on demonstrating competence in various clinical skills, successfully completing theory based quizzes and assignments and projects, or a combination of all four assessment methods.